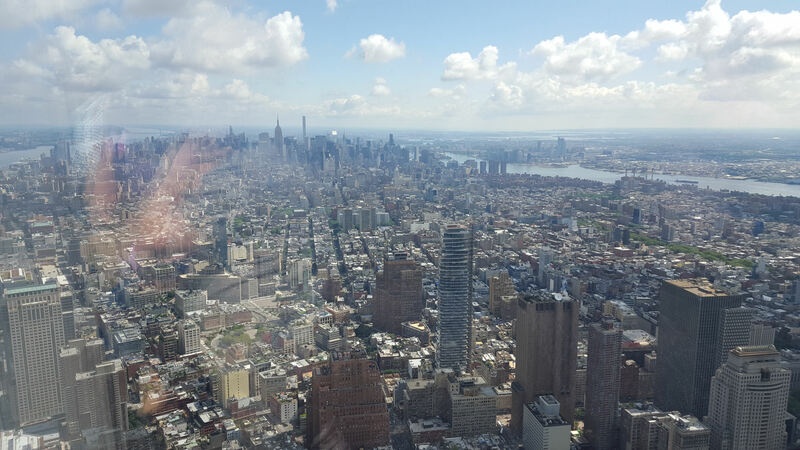 2016 NYC Trip Photos #3: One World, Many Views « Midlife Crisis Crossover! When we began brainstorming the to-do list for our encore visit to New York City, we wanted to see new places and object we missed the first time around. The list included a handful of places we’d seen before but wanted to revisit — either to relive the same impressions or to catch up with recent changes. 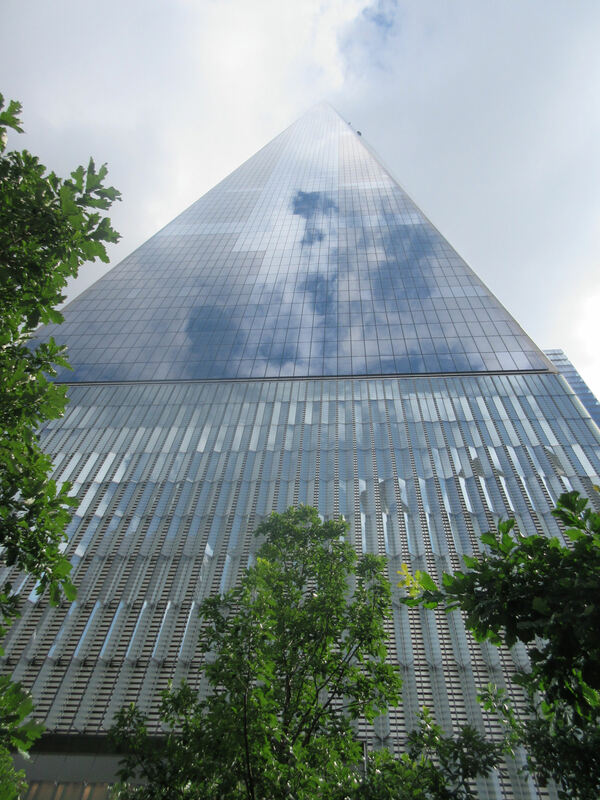 Five years ago, when last we visited the World Trade Center plaza, this skyscraper was an extra-large stump. 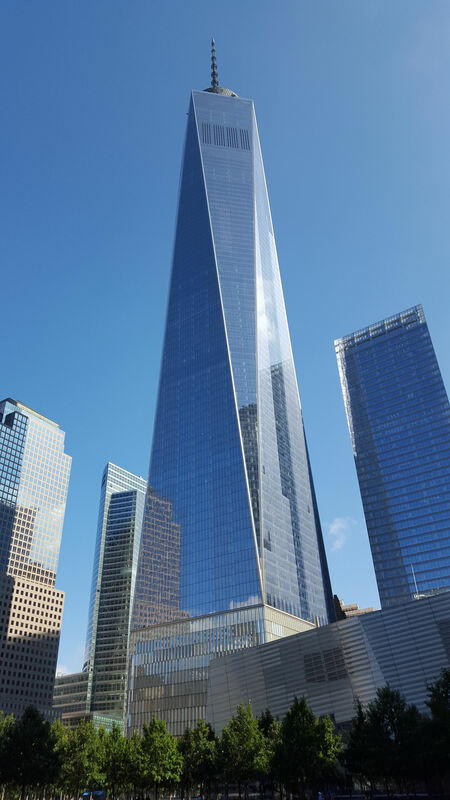 Today it’s the all-new all-different One World Trade Center, the tallest building in the Western Hemisphere. 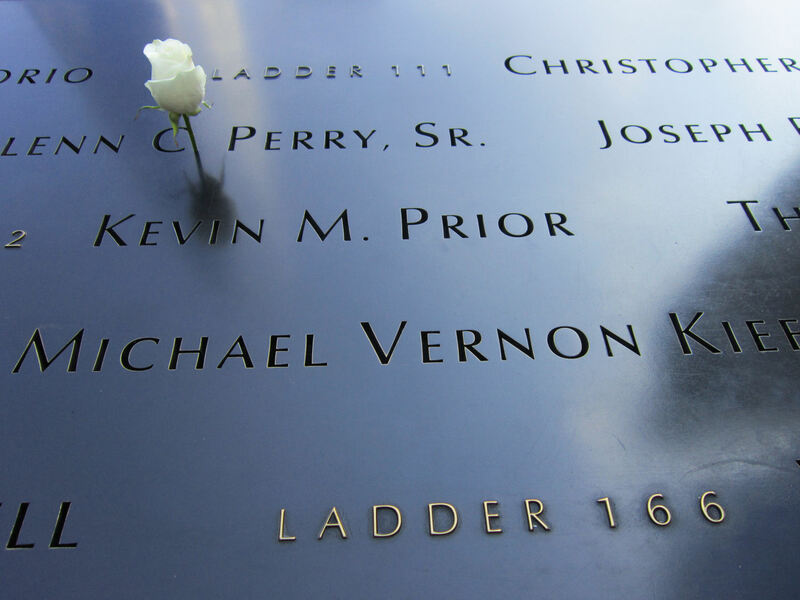 Americans may know it better by its original nickname, the Freedom Tower. On the morning of Day Two, we called it our obvious first stop. 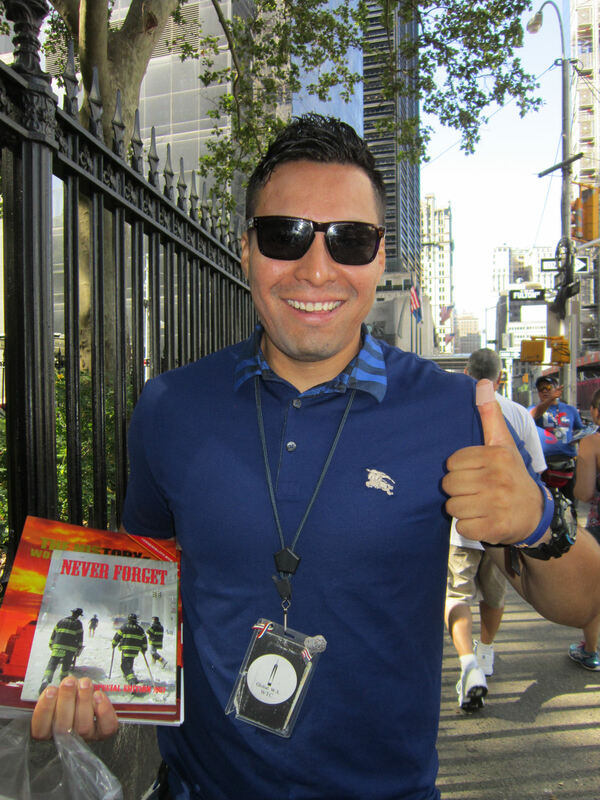 After the E train dropped us off, we had one barrier to overcome before our ticketed tour: a wave of street-side salesman armed with shiny books full of color photos of 9/11 and other related topics. At least two of the guys claimed they each had a photo in one of the books. Part of me questions the veracity of their claims and their enterprise, while part of me recalls the number of self-published authors we’ve run across at conventions, fairs, and holiday expos. Then we decided to shut up, play along, and get into our tourist characters. Would you buy a book from this man? 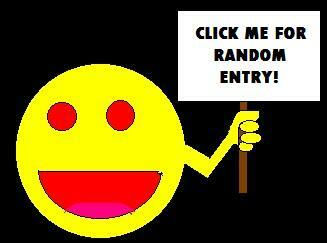 Because one of us sure did, if only so we could move along unfettered. 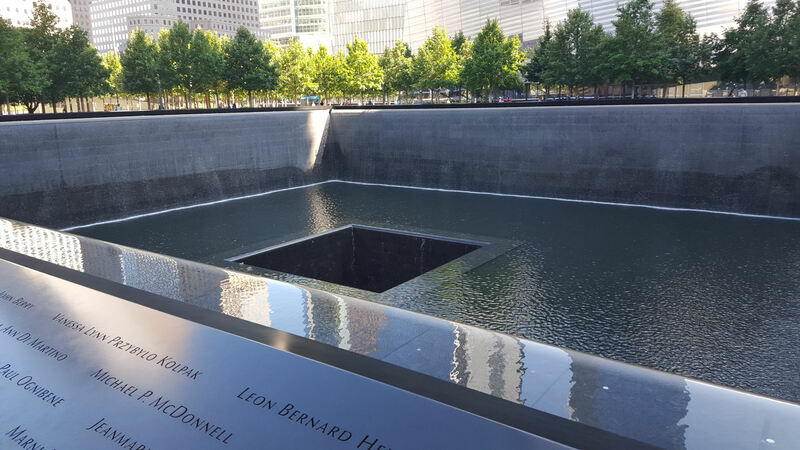 Where once the original Twin Towers stood, today their foundations are the centerpieces of the National September 11 Memorial, replaced with two square pools with hollow centers that extend downward to their former basement spaces. Crowds gathered even on this early Sunday morning, hushed and reverent. The lone dissenter was a silent protestor carrying signs advocating solidarity with the police officers slain in Dallas three days earlier. A police officer approached him and struck up conversation. Their exchange proved so innocuous that we stopped watching and never noticed if they parted on good terms. 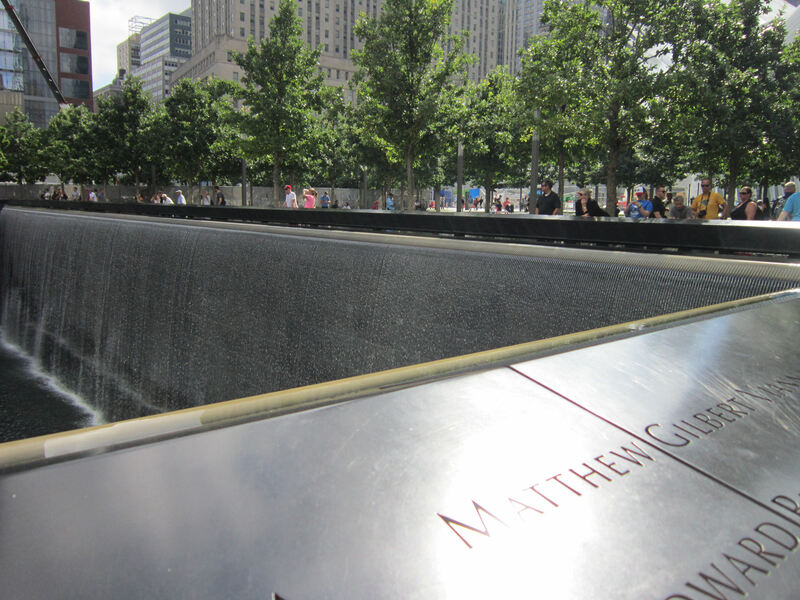 Panels around the edges of both pools list every name of every known victim, from office workers to flight passengers to first responders and every level in between. 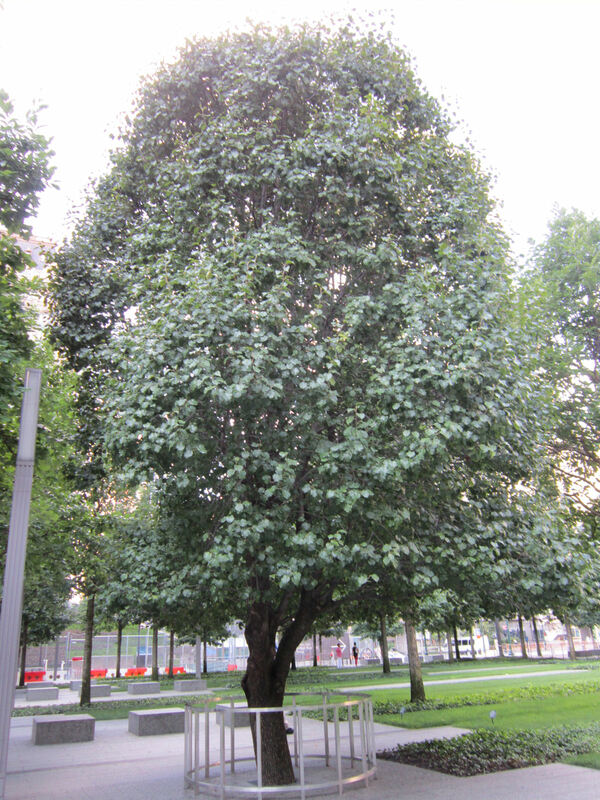 Dozens of trees stand throughout the plaza, none more special than the Survivor Tree, a pear tree that survived 9/11 at Ground Zero. It was found amid the rubble a month into the cleanup process, then nurtured and rehabilitated over the next nine years by the NYC Parks & Rec department. It’s the only tree in the plaza with its own personal tour guide and a security guard on duty nearby. Although the main attractions are completed, construction remains unfinished on other buildings in and near the plaza. 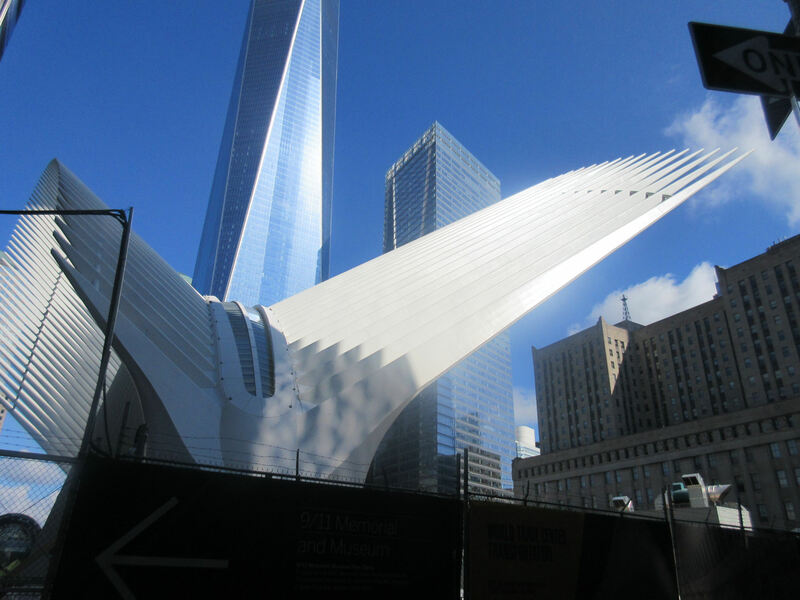 The new World Trade Center Transportation Hub — a.k.a. “the Oculus” — currently serves the PATH light-rail system, with plans eventually to connect to several subways as well as the surrounding buildings. 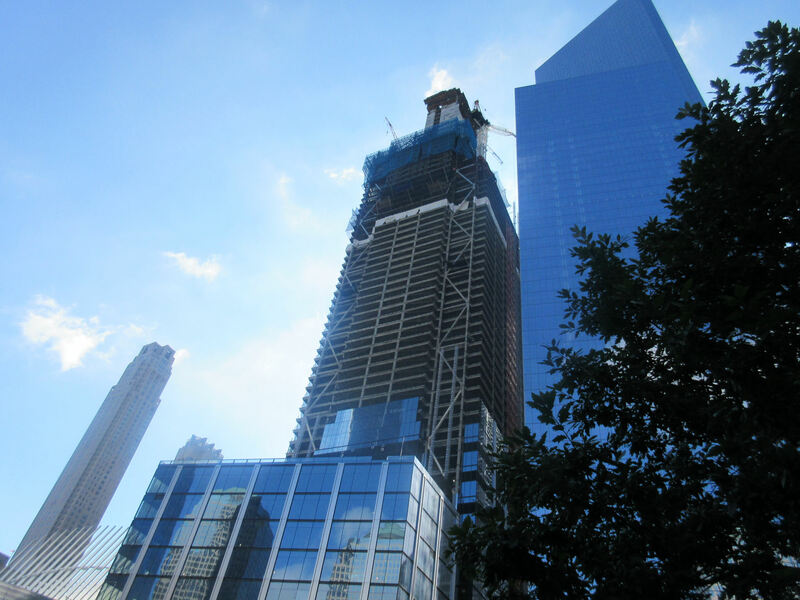 Next door and coming soon is 3 World Trade Center, in the spot that once belonged to a Marriott hotel. Next to it, 4 World Trade Center was finished at the end of 2013. 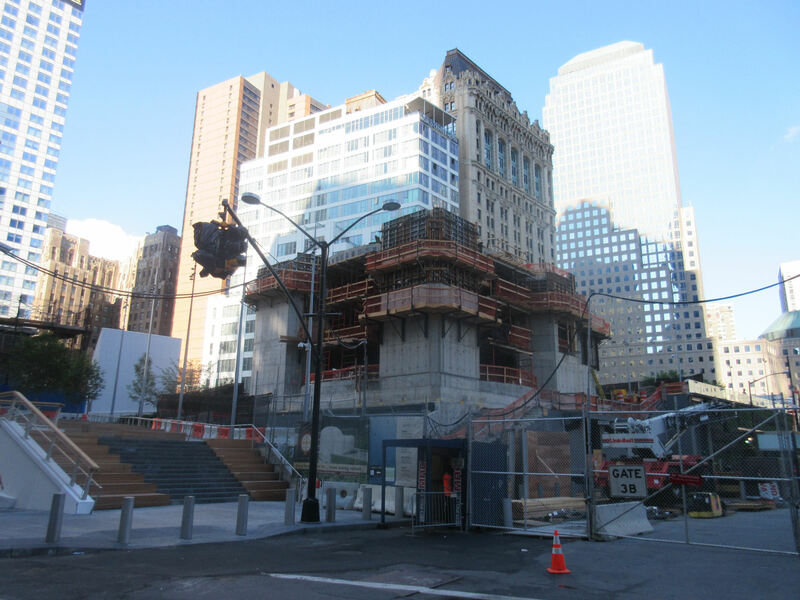 Across the street, work is scheduled to be completed in 2017 on the new St. Nicholas Greek Orthodox Church, replacing the original version that was buried and effectively destroyed in the collapse of the South Tower. 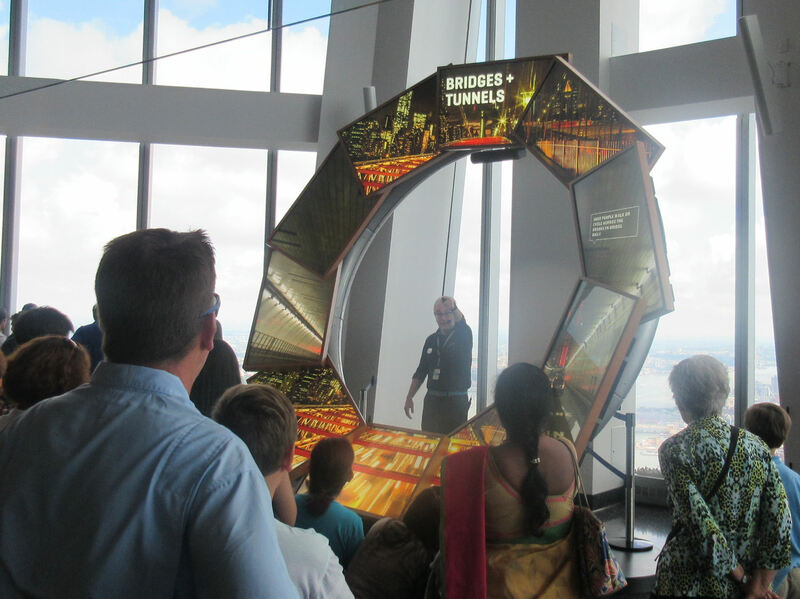 Now open for business is One World Observatory, a must-see destination that takes visitors on a state-of-the-art, technologically marvelous, sixty-second elevator ride from the Freedom Tower’s basement to the 102nd floor without motion sickness or intense G-forces and lets them wander the 100th and 101st floors to their heart’s content. A restaurant, fancy snack counter, gift shop, and cheery guides are some of the amenities waiting stories above the rest of New York City. 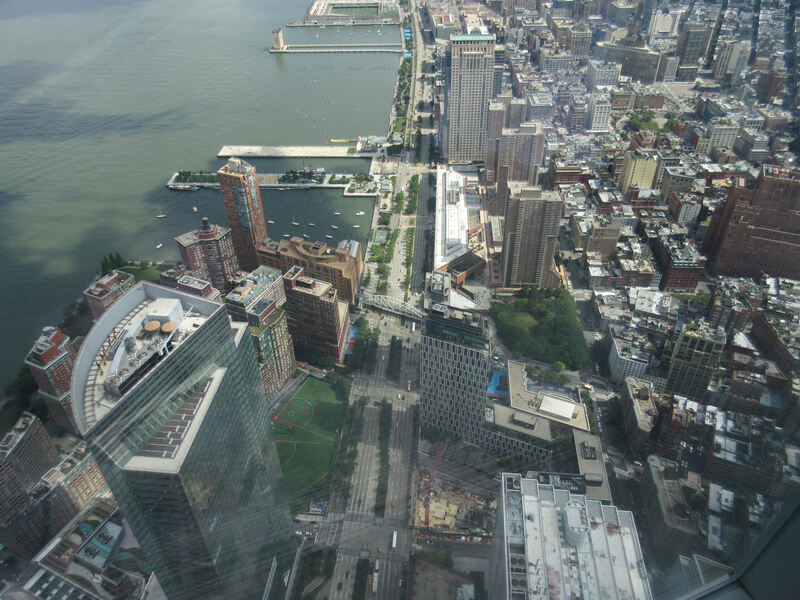 In upcoming MCC entries we’ll show you what else they’ve done with the rest of the World Trade Center complex over the past fifteen years. 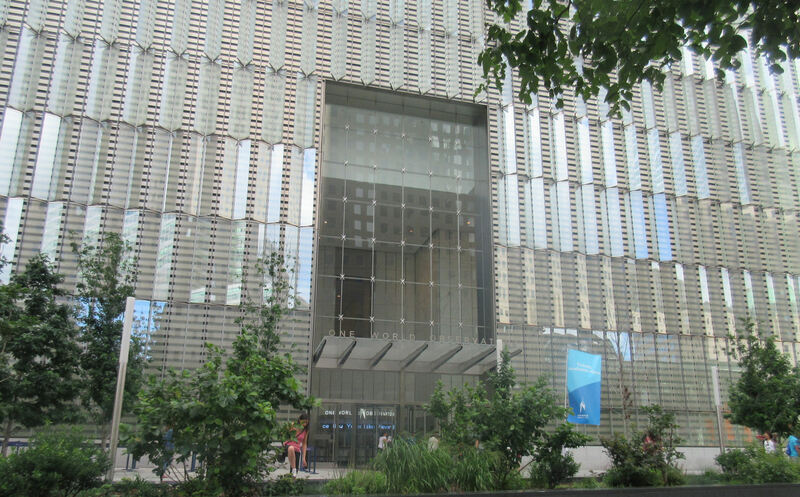 The entrance on the west side of One World Trade Center. The architecture around the lower floors looks oddly fortified, the window etched with patterns that suggest impressionistic barbed wire. The elevator walls are made of digital screens with imagery flashing and metamorphosing as you race heavenward. A fancy audiovisual presentation allows one guide to perform a special presentation about New York, with screens that changed to match his stories when he waved his hands toward the mounted monitor archway. My son and I disagree on whether the device on his wrist activated the changes or if it was a pre-programmed performance that required him to synchronize his movements with precision timing. 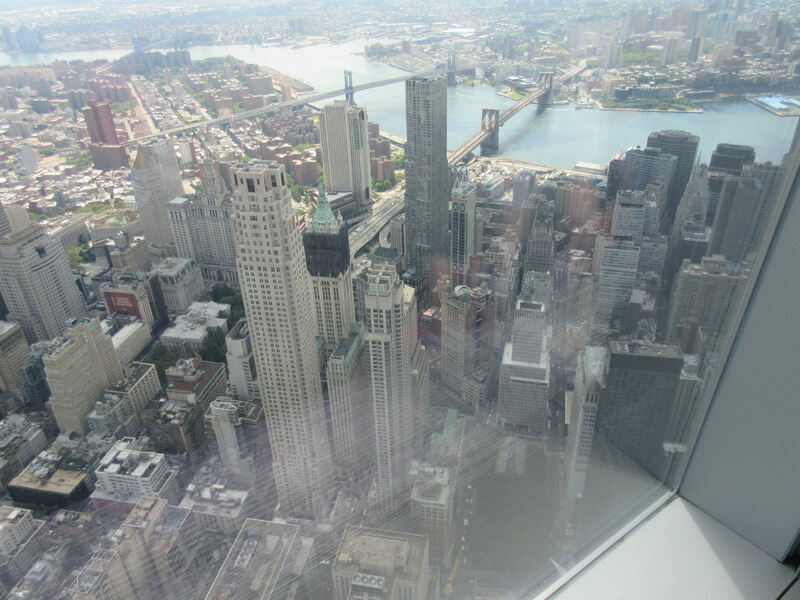 Our special presentation: that glorious, unhindered view of the Big Apple from on high. The view to the northwest, straight down. Viewing Manhattan, straight ahead to the north. Views of the Brooklyn Bridge and Wall Street, among other neighborhoods. That should be Queens in the way, way back. 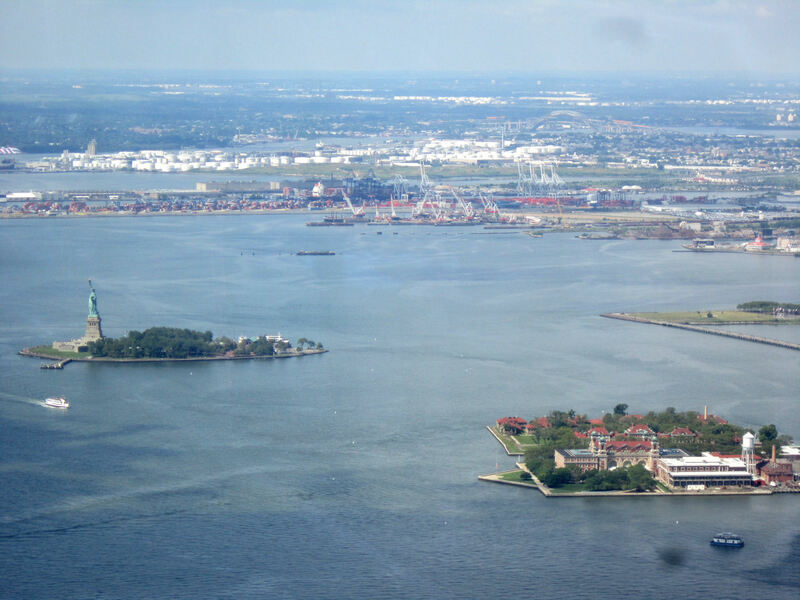 To the southwest, the view of Liberty and Ellis Islands. Someday we’ll share the story of our 2010 visit to the Statue of Liberty as a prequel to both NYC vacations. The observatory’s website motto is “SEE FOREVER”. 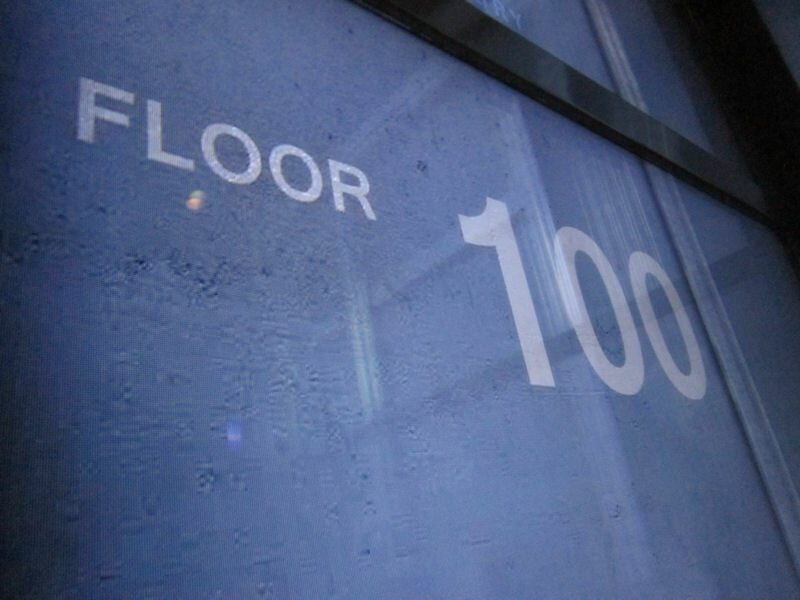 The view from the 100th floor stretches for miles in every direction, but when you return to the ground and look back up where you were, the new Tower seems to stretch for infinite miles in just the one direction.